AM-Notebook is provides a way to store notes (rich text), formula-supported spreadsheets, to do lists, tasks, and calendar with alarm. 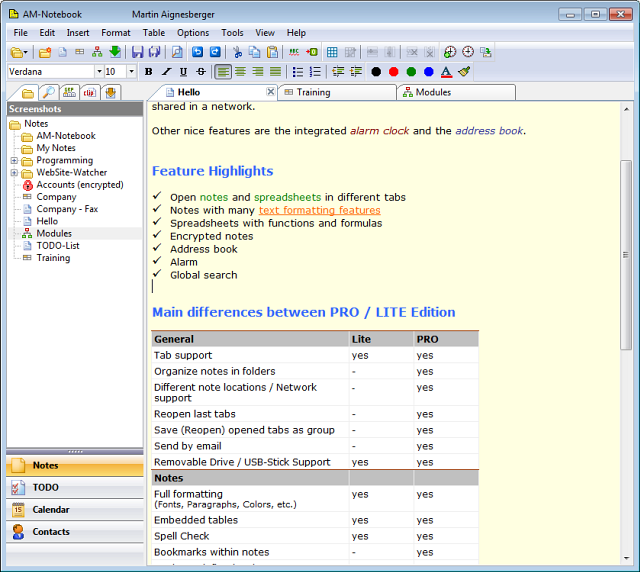 The program works via a simple system tray utility, includes spellcheck and tabbed view. Note: The "Lite" version is missing some features available only in the "Pro" version, including address book, encryption and global search. AM is good, but others you might want to try are Keynote and Totaltext. Both have more features, are portable, and freeware. I've been using version 4.13 for awhile. Love the program. It got even better w/ v5.01. Added Contacts, Calendar, and ToDo list to the notes. Don't need to Extract as it have an option to install portably on a thumbdrive (although no options to choose a folder). I'v been using it for 3-4 years already but didn`t know it was portable. Best notes program with clean gui. Been using the previous version of this program for awhile. Stable reliable lotsa features. good app. Thanks for responding -- I found the typo in my ini file which caused the trouble. Now up and running just fine. Did you edit nbcommon.ini and makes sure "Lite=1" is there? If so, when you start up the app, you will see "AM-Notebook Lite" in the title bar, and it won't bug you with the trial message anymore. PS -- I couldn't register at AM's support forum, their confirmation email never reached me so I couldn't activate my account. Forum registration runs you around to find a fairly well-hidden special "VIP Code", you might need to use Search to locate it. Home page does not explain anything about the "trial period". "You are on day 30 of your 30-day trial. ", today I am on "Day 29". Is the "trial" only referring to the "Pro" features which will be dis-abled in 30 days? Or will the entire app go south?